Click here to read the complete article and to view more fun pictures of the latest Ranch Riding fashions! Ranch Horse Riding has quite a different feel than most typical breed show classes. You won’t find riders dressed to the nines in all of the glitz and glamour, nor horses for that matter with shiny, silver tack and tail extensions. This discipline focuses more on the bond that’s created between horse and rider and allows the pair to show what they can accomplish together as a team. With the desired look requiring horses that move freely, as if they’re loping through a field on a ranch or rounding up cattle, it’s only natural to expect that the rider’s attire should follow suit with traditional Western style. “Obviously, in Ranch Horse Riding classes, we’re not going for the same look that’s required or expected in other show classes,” says horse trainer Steve Meadows of Staunton, Virginia. “It wouldn’t really be fitting nor acceptable for any extravagant jackets or fitted chaps to be worn in this discipline.” Instead, the goal is for the rider to wear attire that’s focused on comfort, function, and protection, rather than trying to look flashy or grandiose. Meadows says, “Ranch Riding is more cow-boy than it is show-boy. That’s a big part of what drew me to this class. Everyone in the show world has to dress a certain way. I want to look like a real cowboy.” He explains that the ideal look riders should aim for is a style they would be comfortable wearing out on the range. This might include a wild rag, heavy chaps or shorter style chinks, a nice fitting cowboy hat, a comfortable long-sleeved shirt, a vest, and a sturdy pair of boots. What’s a wild rag? This cowboy staple is essentially a Western scarf that’s worn around the neck and sometimes embellished with a scarf slider or bolo tie. Part of the standard cowboy dress, the most popular wild rags are made of silk, which is absorbent and wicks moisture away from the skin, provides protection from the sun, and insulates well in cold temperatures. 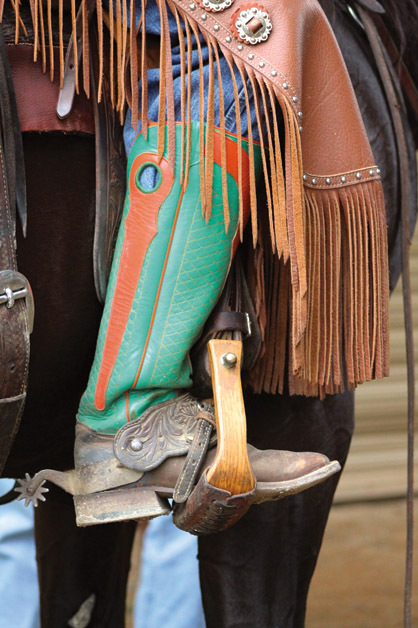 A key point to remember about Ranch Riding apparel is that each piece serves its own functional purpose. Think utilitarian, not fashionista. Some competitors may prefer to wear leg-coverings called chinks instead of full-blown chaps in this event. Chinks are half-length chaps that are worn for protection out in the brush on the range. They were designed to be shorter in length for the purpose of keeping a rider cool in hot climates. “I often wear chinks when I’m working at home,” Meadows says. “But, I show in my heavy duty, shotgun cutter chaps. I also like to wear my denim shirts, wild rag, and a black hat at the shows.” On the other hand, McKibben says chinks wouldn’t do him much good where he lives and rides. He says he needs to have full coverage to keep the brush and cacti off his legs. Many female riders are beginning to wear tall, embellished boots with their jeans tucked into the tops, which are then covered by a pair of chinks. “Last year, I wore regular boots with my jeans over the outside. This year, I will be wearing taller boots and tucking my jeans into my boot tops,” says amateur rider Lisa Pahl of Montpelier, Virginia. “If you look at photos of the old cowboys, they wore chinks and tall boots to keep the brush and twigs off their legs when they were riding on the ranch. Pahl just began competing in Ranch Riding about six months ago. She rides under the guidance of Meadows aboard her palomino gelding, Smart Cutter Fifty. Another perspective on Ranch Horse Riding attire comes from amateur competitor Maggie Bellville of Atlanta, Georgia. Bellville also competes under the guidance of Steve Meadows, too. Bellville began her journey in Ranch Riding in 2014. Her palomino gelding, Classic Chrome, won the 2015 AQHA Honor Roll in Ranch Riding. He is also a Congress Champion and an NSBA year-end Amateur and Open Ranch Riding Champion, along with being a Top 10 earner at the AQHA World Show. The discipline of Ranch Horse Riding encourages individuals to find their personal “inner cowboy” and to bring that look to life in their own creative way, while ultimately focusing on the bond between horse and rider.